Bicker. I love the word bicker. Not that I love bickering, but I think it’s the perfect word to describe itself and it’s meaning. To BICKER means to argue about petty, trivial matters. I’ve noticed that as my children grow, bickering has become more common. I think it’s because they’ve increased in their ability to argue. 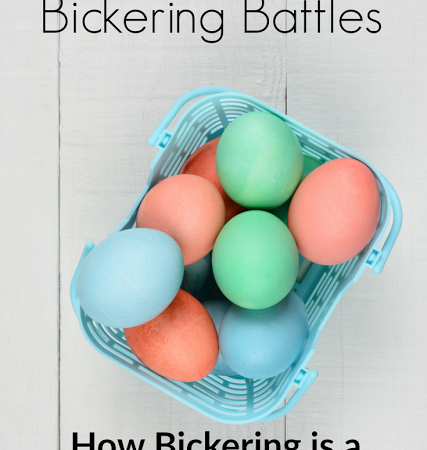 In case you need an example, today I am sharing our little Easter bickering battle and three ways to stop the bickering battles in your family. Picture my sweet household at Easter time, having a family memory of coloring Easter eggs together. The sun is shining. The birds are chirping. 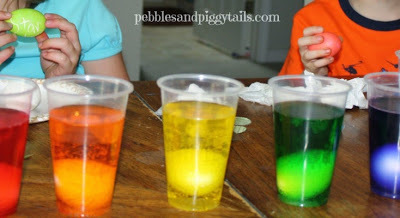 And little boiled eggs are being plopped into cups of colored vinegar water. Sweet Tween is in charge and helping prevent spills. Little Son is methodical and carefully plans his colors. Baby Girl is delighted with each egg as it turns a new color. “No, it’s BLUE,” Baby Girl calmly replies without even looking up (she’s used to this). Little Son, “No, that’s INDIGO!” Voices are now rising. Tension is strong. The fun is leaving our home. Finally, I say with a sigh, “Okay, stop the BICKERING! It can be whatever color each of you wants it to be, and it’s okay if someone has a different opinion . . . Blah blah blah and so on.” Even though I thought it was kinda funny, I often try to curb our bickering because I don’t want them to put someone else down in order to make themselves higher/smarter/cooler or whatever. I want them to recognize it, even in small situations. They do stop bickering because they know if they don’t I’ll eventually put someone in time-out, give out chores, or take away privileges if it gets any worse. Later when Easter was over and all the eggs had been eaten, I noticed one egg left in the fridge. 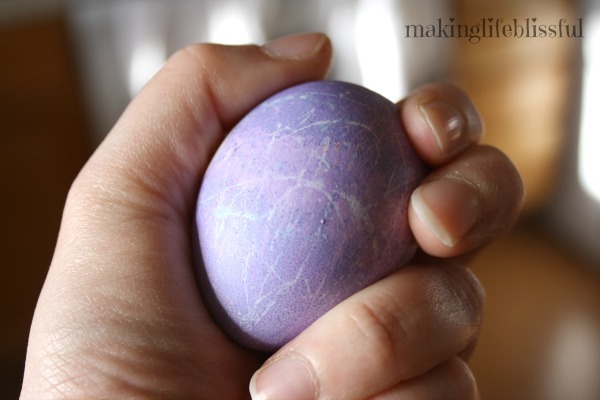 It was the BLUE/PURPLE/INDIGO egg. No one wanted it. It was going rotten. How symbolic. I thought about this afterward. 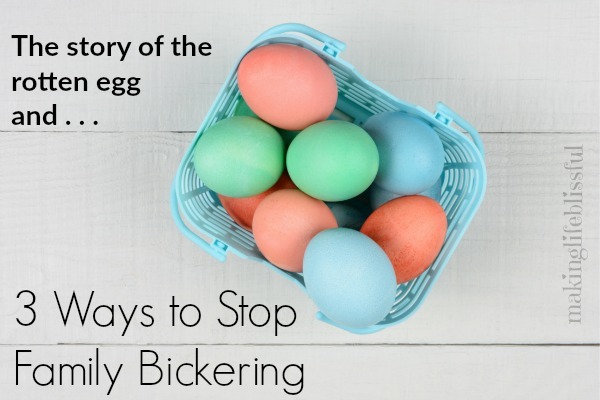 Bickering is like that rotten egg. It seems small and insignificant. But if we let it continue and just leave it, pretty soon that small egg can stink up the whole house. 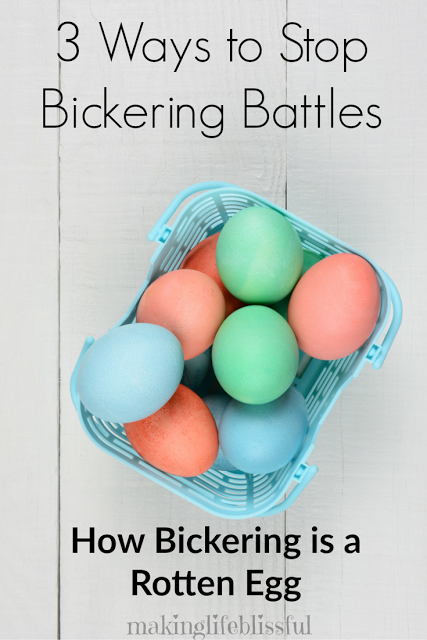 Bickering may be a small thing, but it can stink up the whole household. I’m glad my children are independent thinkers. I’m glad they feel inclined to express their firm opinions. But I also think they need to learn when to just LET IT GO and respect each other and their ideas. They do not always need to prove themselves to be right. 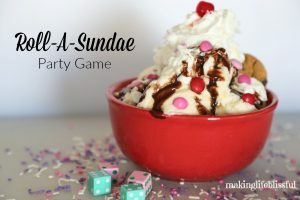 I’m trying to teach this, but it’s an on-going battle. How many times do we as adults let a rotten egg into our conversations with the people we love? How many times do we let our Bickering Battles get the best of us just so we can prove we are right? What would the result be if we let go of our pride and let respect for other people take over instead? So maybe just for today, throw out the rotten egg, end the bickering, and move on. 1. Call it what it is and help them recognize that they are doing it. It’s bickering. It’s fighting. It’s petty. Teach your kids to recognize when they are arguing over unnecessary things. Sometimes we do it without realizing it. This can even be done with humor. If kids are never taught that bickering is wrong, they’ll just keep doing it. They can’t fix it if they don’t realize it’s a problem. Help them know when they are doing it so they can learn to say sorry or settle down. 2. Teach them how to listen. It’s hard to argue when you are truly trying to understand someone. Many times we bicker because we want to be right or prove something. Help them practice listening to each other. When my kidlets fight, I will sometimes make them sit down and take turns listening to each other’s ideas so they can understand the other point of view. They hate it, but it works many times. Eventually, they realize that their sibling is not so bad after all. Listening is a skill. It has to be practiced. Talk to them about how each person’s perspective is important. 3. Show them how to love and let go. Kids and adults alike sometimes need to learn to just “agree to disagree” with others. We have to show our children by example how to walk away and cool down when things get heated. If you are always bickering with other and trying to prove your own views are right, then they will follow right along in your footsteps. And most of all, show the person you are bickering with extra love as the heat from the argument’s aftermath is cooling. Encourage love all a long the way in your family, and it will be the foundation your kids go back to when the bickering is over. 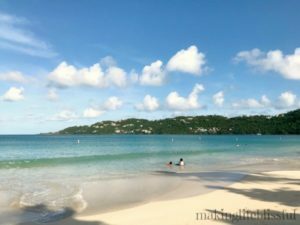 This post has also been published at FamilyShare.com.